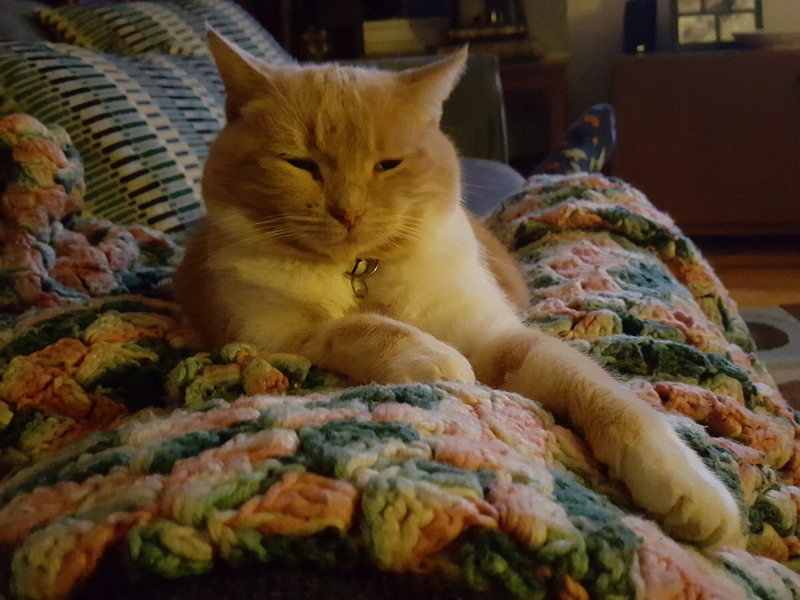 Some pets have that King or Queen like quality! And my Aunt B sure does! We rescued her 4 and a half years ago. She was in a cat rescue and was being shown at our PetSmart in town. Poor thing was marked down in price cause no one was even looking at her! Which is crazy cause she is a beautiful sweet gal with the coolest pink and lavender tones in her fur. We found out she was a muted tabby. Her babies were adopted but B remained in the cage 😦 But she was meant to join our family and that is why she was looked over by others! Well I’ve painted all our pets and B was next. 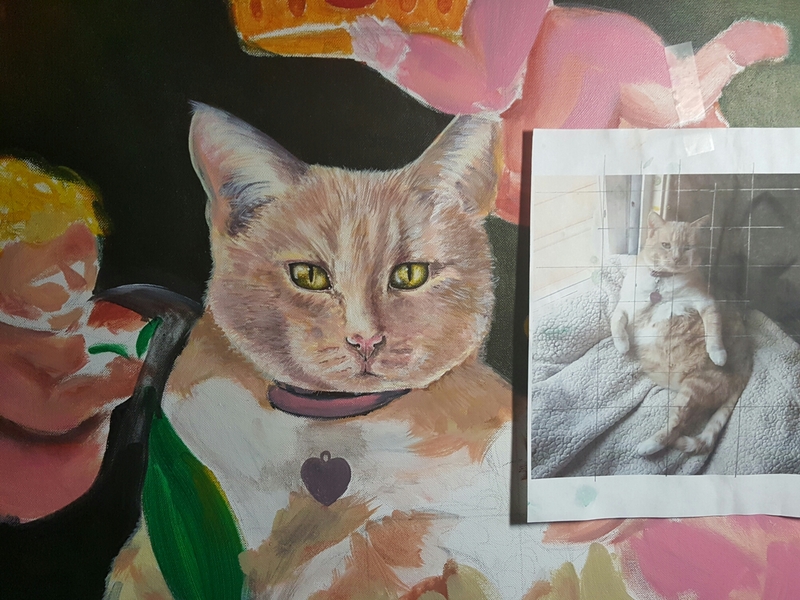 I have been working on and off her royal highness between my commissions and my collection paintings. I had found a cool painting of a black and white cat with cherubs surrounding it and I decided to do my own with Aunt B as the main subject! A good one to practice painting in a somewhat old world style. Worth while event coming up! I will be donating a custom pet portrait that will be in their silent auction! They are an awesome organization that has helped many at risk youths and learn compassion and help animals in need! Canines Teaching Compassion is an Animal Assisted Therapy (AAT) program that helps to change the lives of kids and save the lives of dogs by matching at-risk youth and shelter dogs together. The youth learn positive communication and interaction with one another through teaching the dogs good manners, social skills and basic commands. This training increases the dogs’ chances of becoming adopted, while it teaches the youth impulsivity-control, mastery of a skill, future orientation and the value of restorative justice. The evening will offer dinner, wine, raffle, silent auction, live music & entertainment. 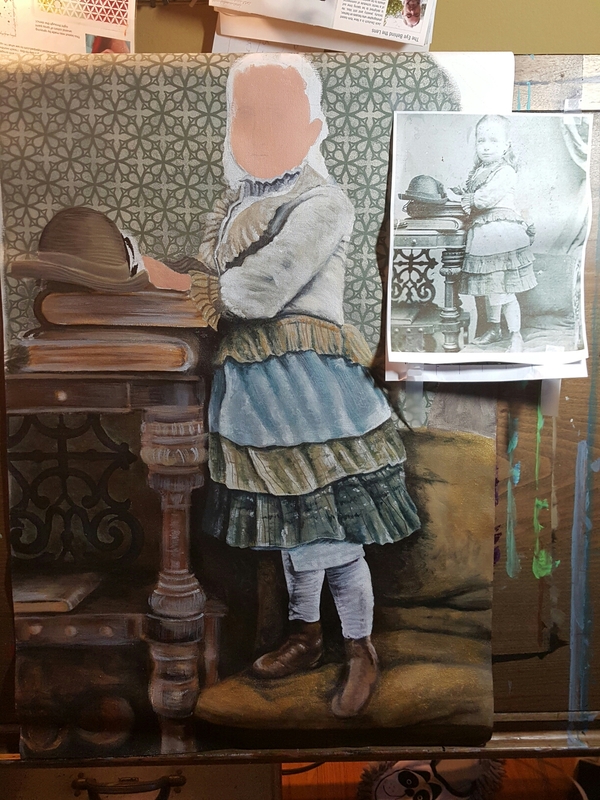 Working on a “Vintage Family” painting and wondering who was she? Her name (that is marked on the photo ) is Josephine Morel from Ireland. This is my husbands side of the family. An old photo late 1800’s? Very early 1900’s? Not sure! This is one of many many of the old pics that I selected to paint. Well going to have to pick my father in laws brain on who she was……. I do have a Facebook page for all you that follow people and businesses on there! I tend to post more of my painting updates on there then do my bloggin here! I am trying to be good and post more here in this new year!! Of course will update any of my events and upcoming shows!